While I was out last night with some friends, another mutual friend came up to us and when we asked her what she had been up to, she proclaimed that she was just coming off “a year of no”. No volunteering. No PTA. No tennis groups. “Can you?” No. “Would you?” No. “Just one?” No. Having gone through a year of no myself, I have to say it can be really quite liberating. You hear that word so often from your children and so rarely have the opportunity to use it yourself, when it comes as an answer to a task request. Our kids are great at it: “Can you clean your room?” No. “Can you take out the garbage?” No. “Can you finish your homework?” No. “Can you turn off the t.v. ?” No. But when we’re asked, “Can you make me something to eat?’ “Can you wash my favorite pants?” “Can you drive me to soccer practice?”, though we would like to say “no”, our answer usually is the obligatory “yes”. And when that overflows to volunteer activities, many times we get sucked into the same mode. “Can you help out at the book fair?” “Can you run the carpool?” “Can you head up the coat drive?” At first, you appreciate having something to do while the kids are at school. But pretty soon, if you’re not careful, when you say “yes” too often, you find yourself spending your time doing things that you’re not passionate about, albeit they’re all good causes. Even if you wanted to try to come up with a way to discover what your inner passion would be, you have no time to explore it. Sometimes, when you go too far to the left with “Yes”, then you find yourself wanting to go far right with “No”, and that’s when you can find yourself experiencing the sabbatical called “The Year of No”. If you’re the type of person who has trouble saying no, then perhaps the only way you can make yourself say it is to draw a firm line in the sand and just make “no” your blanket statement. That way you don’t even have to think about your answer, start to feel guilty and then perhaps change your mind. Usually when you have something personal on your plate that you know you have to spend time on, you get terrified of over-committing yourself. So then, you feel the only way to ensure you don’t say yes to too much is to go with “no” across the board. This is what happened to me a few years ago when we moved houses. I knew packing and unpacking and decorating and getting the kids assimilated into a new school, would take up much of my time, so that is when I entered my “year of no”. So, the moral of this story is though it’s perfectly o.k. and good for your state-of-mind to find a way to feel as comfortable saying “no” as you do to saying “yes”, be careful of making blanket statements of “no” for such a length of time that would make people start expecting that as your answer. You never want to pigeon-hole yourself in a way that it is hard to break back in when you’re ready to come back. So, mix it up a little. Pick one or two things within each of your social groups (friends, school community, town community), that you think you can fit into your schedule during your “hiatus”, and start off the year knowing that when those things come up, you will say “yes” to them. Schedule in time to check in with your friends, even if it is to comment on their Facebook page, or send a quick text, “Still trying to get my head above water, but looking forward to getting together next month.” Keep the lines of communication open and don’t let people forget about you. 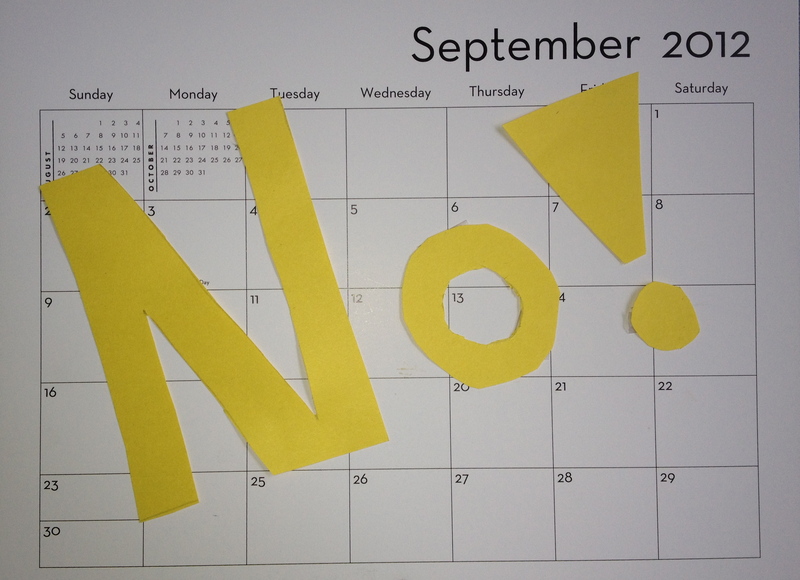 If you need a “Year of No” once in awhile, just turn it into a “Year of No, But With Some Specifically Designated and Well-thought Out Times of Yes”. That way, when the pressure has eased, and you’re ready to jump back in, you don’t find the pool closed and have to struggle to reopen it again.